The Warrior Success Center (WSC) provides free and accessible services and resources for student success. Individualized advising to students and help deciding students identify majors and careers that are best suited to their unique interests, strengths and goals. We actively collaborate with a variety of programs and departments at WSU as well as community partners. Have tough questions? Feeling overwhelmed? Not sure where to turn? The Warrior Success Center has one goal—to help you be successful and reach your goals. We can assist you with transitioning to college, choosing a major, improving your grades, preparing for the job search, and much more. If you have a diagnosed disability, we can even help you identify and benefit from necessary accommodations. If you need help, don’t hesitate to contact us or set up an appointment. This is what we do. If you have any concerns about your student’s adjustment to college, academic performance or career preparation, we can help. 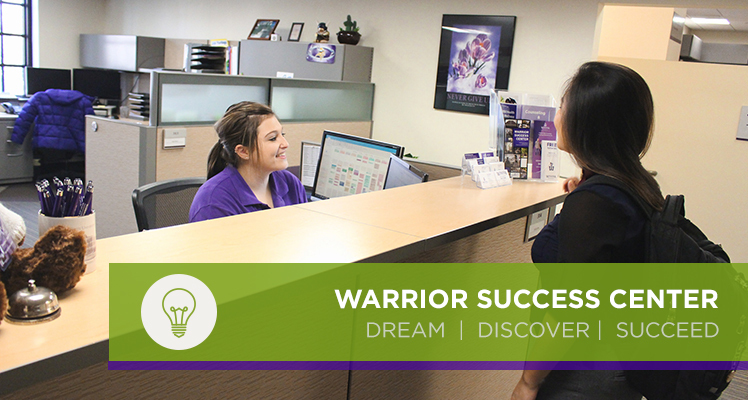 The Warrior Success Center is staffed with professional academic and career advisors who meet one-on-one with students and offer customized support and guidance. You can trust us to assist your student whenever needed along their educational journey. When in doubt, send your student to us. First off, congratulations! Would you share how you're doing after graduation by taking the Graduate Follow-Up Survey? Your feedback helps WSU improve support services for current students.